Lovely La Jolla Shores Getaway - Easy Walk to Beach! Read our reviews & guestbook comments! Now with 1-car garage & Netflix! 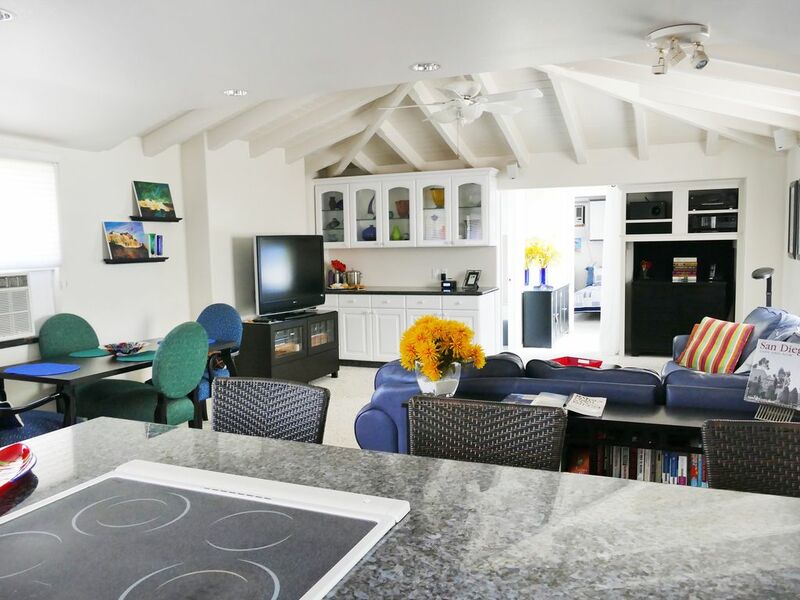 Walk to the beach in 4 minutes from this charming, clean and centrally-located, 2-bedroom, 2-bath, 2nd-story residence overlooking Avenida De La Playa. Everything you see in our photos is within walking distance. Inquire with owner for monthly rates. Here's why our guests call this the perfect location. No nighttime beach party noise, but still close enough to roast marshmallows with the kids before retiring. The living area is a delightfully relaxing, open, combined living/kitchen space with a bedroom and bath at each end. If clean and comfortable are important to you, this is a jewel. 'Westin Heavenly Bed' king mattress in the master bedroom & new twin mattresses in the second bedroom 2013. The living area and master bedroom include flat-panel TV's. Cable and wireless high-speed internet & printer are available. Granite counters, ceiling fans, a/c and plush carpeting throughout. New washer, dryer & dishwasher in May 2015. Your private entry gate is complete with security code. You will be delighted at being just steps away from many of the area's best casual and fine-dining restaurants. The Marine Room, Piatti's, Barbarella's, Osteria Romantica, Cusp, Shorehouse Kitchen, A Shore Thing, The Cheese Shop, Jeff's Burgers, Brick & Bell, El Charro, Starbucks, Subway and the Shores Restaurant are all just yards away. A bus stop is within walking distance for those who want to sightsee in the San Diego area without a car. La Jolla Shores has something for everyone. This large, beautiful beach is patrolled by lifeguards and allows swimming, boogie boarding, surfing, kayaking, scuba diving & snorkeling. La Jolla Shores is the site of one of the nation's most precious underwater marine preserves - a delight for snorkelers and divers. Adjacent Kellogg Park also provides large, grassy picnic areas, including bathrooms and new children's playground equipment. We also provide: beach towels & chairs, boogie boards, sand toys, folding wagon, iron & board, rolling cooler, pack-n-play, high chair, hair dryers, laundry in unit & laundry products. Please click 'Links to More Information' at the bottom of this page to visit our web site for more photos & details. Right from the start, Terrie was extremely accommodating and made sure we had everything we needed well before we arrived. Her home was so comfortable and lacked nothing. The location was perfect! It was close to everything; a short drive to wherever we wanted to go. It was so nice to come back home to the quiet quaint area of La Jolla Shores. Other highlights: the spacious living area, washer and dryer, well stocked kitchen, and garage! Terrie recommended the restaurant Osteria Romantica, about a block from her home, of which we tried out on NYE. It was fantastic! The only challenges we had was the complicated tv system in the living room, and the front door locks took a bit of practice before we had it down. We'd love to come back again! Thank you SO much for taking time to review. I'm very glad you enjoyed the place! Sorry I was not in town during your stay. Thanks for the feedback about TV and the door locks. I think I should replace the one with a deadbolt. It is usually the stiff one. I will also type more detailed TV instructions to help when I am not available. We stayed in two rentals ourselves during the holiday and struggled with TV systems, so I know how frustrating that can be. We would love to have you return! Thanks for leaving the place in such nice condition. This apartment is a lovely and spacious, warm, cozy unit on the main street of La Jolla Shores just a few short blocks from the beach. The apartment is family friendly and has everything you could possibly need. The location is excellent as it is smack in the middle of cafés and restaurants and a two block walk to La Jolla Shores beach and park. Terrie is a wonderful and friendly host and is incredibly helpful and available if you have any questions. Highly recommended and would stay anytime I am in the area! We spent ten days here just after Labor Day, and had a great time. To begin with, the unit was absolutely spotless. Plenty of room for two couples to spread out and enjoy each other's company. Fully stocked and a useful open-architecture kitchen. The spot in the parking garage is priceless, as parking is a scarce commodity in this neighborhood. The location is right in the middle of the "action"- just above the main street of La Jolla Shores, with its dazzling array of fine eateries. Grab a smoothie at Brick & Bell, just a few steps outside your door, and enjoy watching the world walk by! The beach is only a few blocks away. Terrie is a gracious and accommodating host. We look forward to returning here. Thank you for taking time to do a review. I'm so glad the place worked well for you all! We would love to have you again! The house has everything you could possibly need and more. Owner is very helpful and accessible. Thank you again for your stay, and thanks so much for taking time for a review! I really enjoyed meeting all of you and hope you can come back again. Thank you once again for coming and for taking time to post a review, even right after vacation! I know how busy things are for a family with kids, so I always appreciate you thinking of that. We love having your family come & love getting to see the kids grow from year to year. I hope you can keep returning for a long time! Terrie is super kind and takes wonderful care of the property. She was very understanding even when we broke her tea pot. The locations is walking distance of everything you would possibly need. The garage is very handy for parking since parking can be tricky at times. The kids really enjoyed the beach toys and some of the games inside the house. Highly recommend. The La Jolla Shores community has something for everyone, La Jolla Shores beach is one of the few beaches in the San Diego area that permits almost all activities in one place - kayaking, surfing, snorkeling, scuba diving, swimming, boogie boarding & small craft launching right from the beach. It is a comfortable place to spend the day, because this beach area also provides lifeguards, bathrooms, showers and a grassy picnic area complete with tables. There are plenty of restaurants within walking distance, from fine dining to places where you can pop in wearing your swim suit and sandals. Please visit our web site. Until confirmed, rates are subject to change without notice. This is a single residential setting with private entry. While the listing states "condo," the property is not part of a condominium complex but a separate, second-story private residence.